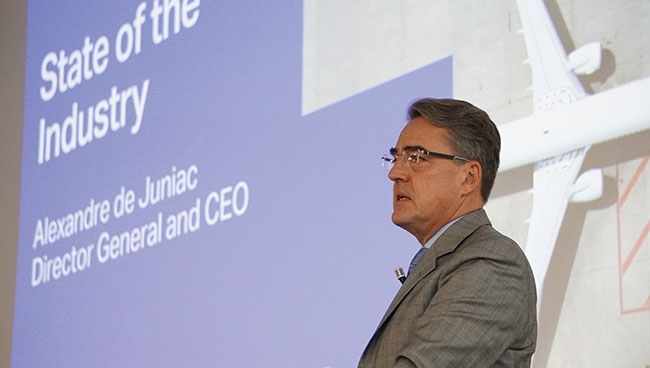 alexandre de Juniac of IATA expects a sharp fall in oil and solid GDP growth to provide a buffer. Highlights of IATA’s projected 2019 performance include: The return on invested capital is expected to be 8.6 per cent (unchanged from 2018); margin on net post-tax profits is projected to be 4.0 per cent (basically unchanged from 3.9 per cent in 2018). Overall industry revenues are expected to reach $885 billion (+7.7 per cent on $821 billion in 2018). Passenger numbers are expected to continue a climb reaching 4.59 billion (up from 4.34 billion in 2018). Cargo tonnes carried are expected to reach 65.9 million (up from 63.7 million in 2018). However, IATA projects there will be slightly lower demand growth for both passenger traffic (+6.0 per cent in 2019, +6.5 per cent in 2018) and cargo (+3.7 per cent in 2019, +4.1 per cent in 2018). IATA also projects an average net profit per departing passenger of $7.75 ($7.45 in 2018). Lower oil prices and solid – but slower – economic growth (+3.1 per cent) are extending the run of profits for the global airline industry, IATA explains, after profitability was squeezed by rising costs in 2018. IATA projects that 2019 will be the 10th year of profit and the fifth consecutive year where airlines deliver a return on capital that exceeds the industry’s cost of capital, creating value for its investors. In terms of economic growth: GDP is forecast to expand by 3.1 per cent in 2019 (marginally below the 3.2 per cent expansion in 2018). IATA explains this slower but still robust growth is a main driver of continued solid profitability. But the group also points to what it calls significant downside risks to growth from trade wars and political uncertainties like BREXIT, noting these factors are unlikely to offset the positive push from expansionary fiscal policy and growing business investment. IATA projects jet fuel prices will average $81.3/barrel in 2019, lower than the $87.6/barrel average for 2018; and that fuel is expected to account for 24.2 per cent of the average airline’s operating costs (an increase from 23.5 per cent forecast for 2018). Total employment by airlines is expected to reach 2.9 million in 2019, up 2.2 per cent on 2018. Wages are also rising, according to IATA, projecting that unit labour costs will increase by 2.1 per cent in 2019 after a long period of stability. In 2019, IATA expects productivity to increase by 2.9 per cent to 535,000 available tonne kilometres/employee. Passenger traffic (RPKs) is expected to grow six per cent in 2019, according to IATA’s State of the Industry report, which will outpace the forecast capacity increase of 5.8 per cent, and remains above the 20-year trend growth rate. IATA explains the 3.7 per cent annual increase in cargo tonnage to 65.9 million tonnes is the slowest pace since 2016, reflecting a weak world trade environment impacted by increasing protectionism. Cargo yields are expected to grow by 2.0 per cent, well below what IATA describes as the exceptional 10 per cent yield growth in 2018. It does, however, continue to benefit from the recent strengthening of the cargo business, says IATA, since cost increases are lower. Overall cargo revenues are expected to reach $116.1 billion (up from $109.8 billion in 2018).